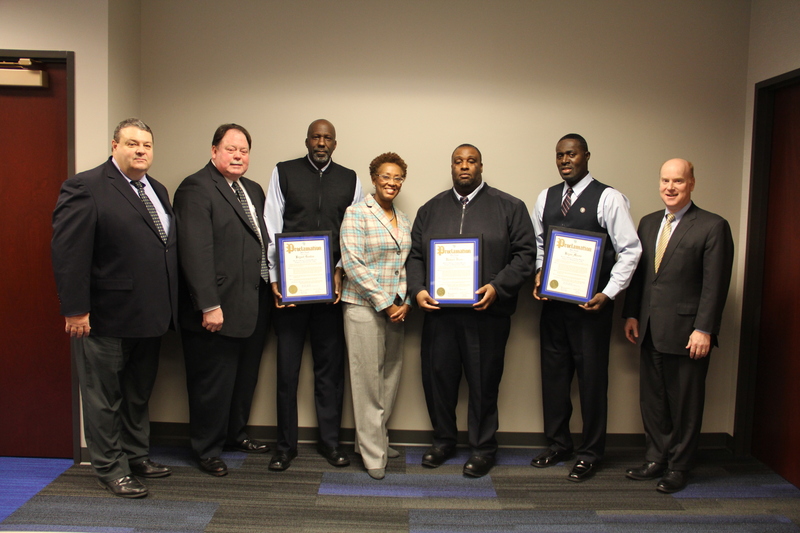 MetroBus operators Bryant Goston, Bryan Moore and Richard Hines were recognized this morning at the Bi-State Development (BSD) Board of Commissioners meeting for their heroism and bravery after assisting motorists trapped in an overturned car fire earlier this month. The Commissioners, BSD President and CEO John Nations, Metro Transit Executive Director Ray Friem and others in attendance celebrated the three men for going beyond the call of duty and risking their lives to help save the lives of others. On the morning of February 5, 2016, MetroBus operators Goston, Hines and Moore were taking their break at the Riverview Transit Center in North St. Louis when they heard the unmistakable sound of two vehicles colliding. They ran over to investigate and found that one of the vehicles involved in the accident had overturned and was on fire, trapping four people inside. Goston, Hines and Moore immediately grabbed the fire extinguishers from their buses and jumped into action. They pulled the victims from the burning car, quickly extinguished the flames, and kept bystanders safe as they contacted emergency responders. Since then, the three men hadn’t thought too much about the incident, and were surprised at the attention they started to receive when their story got out. MetroBus operator Goston has been with Metro transit for 11 years and currently serves on the #61 Chambers MetroBus route. MetroBus operator Hines has been with Metro transit for 11 years and currently serves on both the #70 Grand and #90 Hampton MetroBus routes. MetroBus operator Moore has been with Metro transit for 25 years and currently serves on the #36 Spanish Lake MetroBus route. This type of genuine love for our fellowman is what initiates such bravery and selflessness! This is the type of legacy that should be instilled in the hearts of every man, woman, boy and girl.